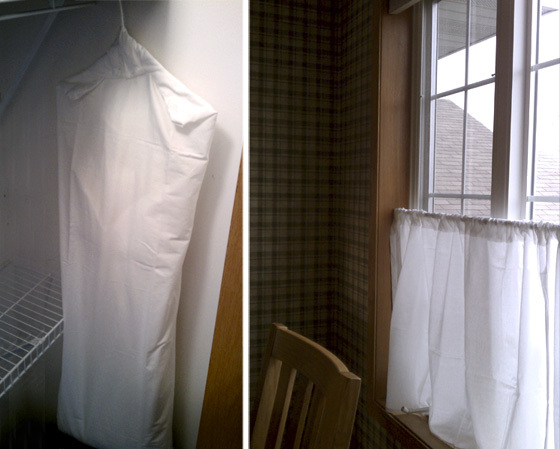 What was once a white sheet from IKEA is now a garment bag + curtain! Love it. While I was getting my wedding dress altered, the seamstress told me to preserve my gown I could make a simple sheath-type bag for it, with a hole for the hangar, and it would be able to breathe yet be protected. Thus the sheet, with one cut and two seams, became a garment bag. The train is encased in the sheet and folded up the back, with the remainder of the sheet pinned over the top of the hangar [those two triangles you see]. Safe and sound. The curtain was even easier. The window happened to be the right length for the height of the sheet, so three sides were already finished for me! Love that. A few pins + a 2" seam later, a curtain was born. Our home is a split level with no neighbor across the street, so we now have privacy from the street + sidewalk, while still enjoying the view and gathering sunbeams. Perfect. Not quite a refashion, but extremely pleased to have these sewing projects finished nonetheless. Now off to read your blogs and see what projects you've been accomplishing! [update] For those that want more details as to the creation of the garment bag, check out this illustrated guide. My summary description of one cut + two seams wasn't clear? :-) I'll try to add an illustration for the curious that explains it better. Thank you both for enjoying my project with me! What a great idea! Sometimes the simplest refashions bring the most joy. And, I bet it's so nice to know that your gown is safe and sound!